Ageing brings changes that are difficult to understand, especially for children. When the memory begins to fail, the person who is forgetting might look the same, apart from an extra wrinkle or two. And a loved one who forgets can often still watch, listen and carry out simple conversations with aplomb. It's just that they don't remember. Grandma Forgets opens the door to this conundrum. Without playing down the harsh reality of memory loss, Grandma Forgets brings a lightness, even a little joy to what is often distressing in the extreme. Two school-aged grandchildren talk with open acceptance about their Grandma and how she forgets. Through their words they help others see the reality of dementia, but they also demonstrate that Grandma can still be included in family life, despite her memory loss. My heart broke a little as I read Grandma Forgets because some of the pages were a little too familiar. But gentle hints at the funny side of life gave me space to breathe. These humorous asides brought emotional balance and even hope that those who forget can still be very much included in every day family life. 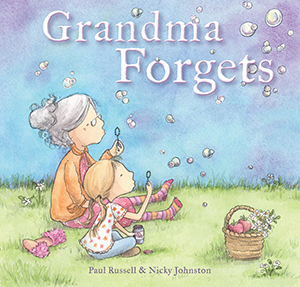 Grandma Forgets is a timeless treasure made especially for children (and their parents) who are trying to come to terms with dementia. Thank you for such a delightful review.